Historic hotel pipes exist within the walls of some of the most beautiful and treasured buildings in our country. In order to maintain the integrity of these historical structures, building maintenance and facilities managers have a two-fold responsibility when it comes to preserving them. Age wreaks havoc in galvanized and copper pipes. Access to the domestic water system piping in these buildings can happen in one of two ways; cut holes in walls and ceilings or find a way to get inside the pipes themselves. ePIPE® is smart technology that prevents historical buildings from having to compromise history by preserving it. Even better, it is durable. This patented epoxy coating pipe-lining process restored historic hotel pipes almost 20 years ago in the Mayflower Park Hotel in Seattle and the Biltmore hotel in Los Angeles. 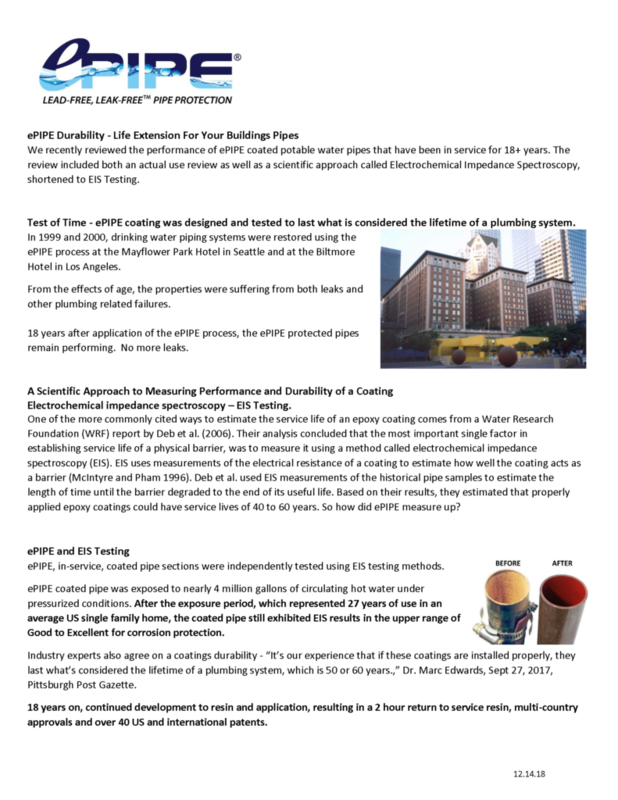 The case study presented here tells the story and gives credible scientific proof of the durability and longevity of the Ace DuraFlo ePIPE® process. TDT Plumbing joined the Ace DuraFlo ePIPE® team in 2006 and we have successfully refurbished thousands of commercial and residential pipes since then. The technology is trusted by schools and hospitals to bring safe, clean drinking water to our most vulnerable of populations. Long-term, non-invasive, environmentally safe and conscious solutions are wins for everyone. The ePIPE process can be performed with surgical precision in occupied facilities which keeps revenue flowing and residents or guests in place while work is being done. Download this PDF and use it as a conversation starter when you’re faced with the hard choices that historic buildings must make to preserve their history. Stakeholders want assurance that their investment is protected. We want to give you the information and confidence you need to make the decision to re-pipe or ePIPE one that takes stress and disruption out of the equation. TDT Plumbing is ready to take on your historic hotel pipes in Houston, San Antonio, and Austin. Visit our website at www.tdtplumbing.com or call (713) 697-2088 to arrange a free inspection.